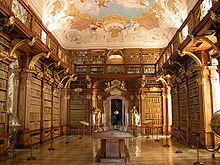 Biblioteka Załuskich, built in Warsaw in the mid 18th century. Circulating library and stationery shop, Gulgong, Australia 1870. James Silk Buckingham led the campaign for public libraries in the mid 19th century. The turn of the 20th century witnessed a tremendous expansion in the provision of public libraries in the English-speaking world. Pictured, the Peter White Public Library built in 1905. The Robarts Library at the University of Toronto!University of ਟੋਰਾਂਟੋ, ਕੈਨੇਡਾ. ↑ ਗੁਰਬਿੰਦਰ ਸਿੰਘ ਮਾਣਕ. "ਸਕੂਲ ਲਾਇਬ੍ਰੇਰੀ ਦੀ ਹੋਵੇ ਸੁਚੱਜੀ ਵਰਤੋਂ". ਪੰਜਾਬੀ ਟ੍ਰਿਬਿਊਨ. ↑ "ਸਿੱਖਿਆ, ਸਕੂਲ, ਲਾਇਬਰੇਰੀ ਅਤੇ ਵਿਦਿਆਰਥੀ - Tribune Punjabi". Tribune Punjabi (in ਅੰਗਰੇਜ਼ੀ). 2018-11-01. Retrieved 2018-11-18.